When we bought the Tacoma it came with a sadly thin folder of records and receipts. We immediately changed all the fluids and started an intensive bout of research by joining some of the leading Tacoma, 4×4 and off-road forums like TacomaWorld, ExpeditionPortal and Yotatech. After untold hours of interesting reading we narrowed down a couple of areas this truck might have known issues with and how best to handle those. As much as we rely on the Tacoma to ferry us and our gear around we want to keep it running as well as we can. Beside fixing any problems as soon as they crop up that also means preventative maintenance. As far as I know every modern internal combustion engine on the road today has something called a timing belt or chain that synchronizes the rotation of the crankshaft and the camshaft(s) so that the engine’s valves open and close at the proper times during each cylinder’s intake and exhaust strokes. In an interference engine the timing belt or chain is also critical to preventing the piston from striking the valves. Our Tacoma is lucky enough to have a non-interference engine. Most manufacturers specify a 60-90,000 mile replacement interval and the Tacoma had 113,000 miles on it when she became mine. 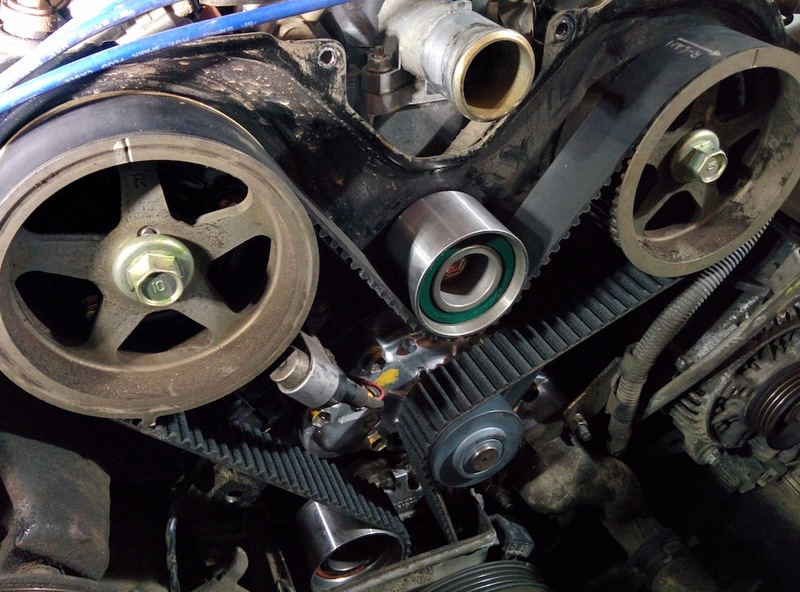 The previous owner stated he had not replaced it and so we decided that a new timing belt was near the top of our preventative maintenance list. With our non-interference engine a broken timing belt would mean the engine would just stop working correctly and we’d be left stranded at the side of the road with a several hundred dollar bill, mostly labor costs. Not good. With an interference engine all that would apply plus add horrible grinding, clanking and smoking from the engine and a several thousand dollar bill to rebuild the engine while replacing all the parts that attacked and ate each other during their sudden, violent and unplanned meeting. It’s good to have a non-interference engine. Many of the places we trek to have poor-to-no cell reception and I’m guessing AAA probably cannot get to us in a timely fashion. With that in mind, the thought of having a $30 part cause us hours if not days of undue stress and strife and hundreds of dollars in bills is unacceptable and so we made plans to get it changed along with the water pump, thermostat and other belts all at the same time. The general consensus in the forums was that Aisin made quality parts and so we found and bought the Engine Timing Belt Kit with Water Pump from Amazon. Our timing (I am very witty) could not have been better. After my mechanic buddy and I pulled the front of the engine apart we found that the timing belt had small cracks in it that were only going to get worse and the water pump had recently started to leak through both its seep holes and soon enough would have caused us problems. Once the new pump, thermostat, pulleys and tensioners were all on I took a quick picture to document the new, pretty, shiny stuff before we buttoned it all back up. All new, shiny and squeak-free before the front engine cover goes back on. With all that as well as the other three new belts we installed (AC, alternator and power steering) the engine purrs like a kitten again with not a squeak or rattle. With the timing belt at proper tension again I would swear the timing has advanced enough that we got a tiny bit of noticeable torque out of it for the time being as well. Bonus. The other major fix I have performed so far is replacing both of the front axles. 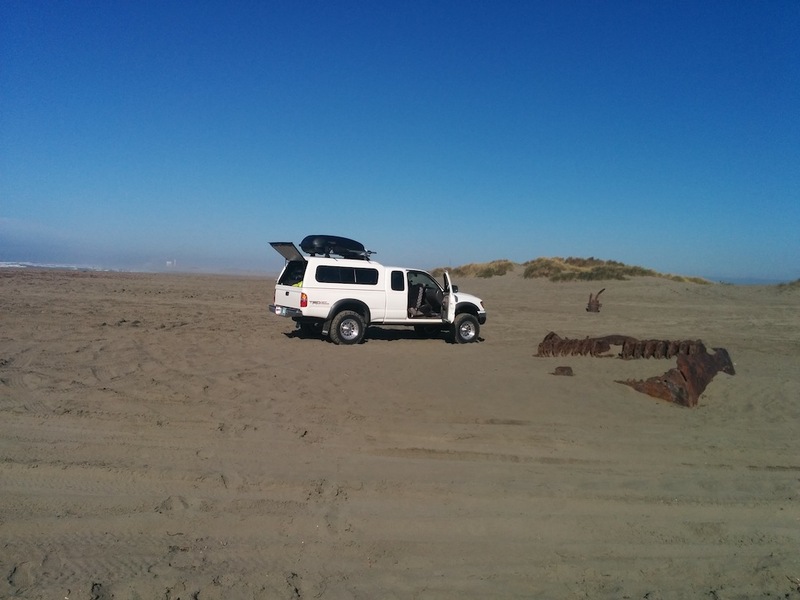 One was starting to make a bit of noise but we still decided to play around a bit in the Samoa Dunes near Arcata, CA. Aired down to 20 psi and tried our hand at sandy fun. Needed the 4×4 but the truck made it anywhere we pointed it until we bounced over a seemingly small rock and immediately began to feel a noise and vibration. Pulled to a stop to take a look and saw that the front driver’s side CV boot was half missing, grease had been flung everywhere and sand was now coating the entire CV joint assembly. Damn. I carry some spare parts but an axle and boots were not with us at the time. They are now. 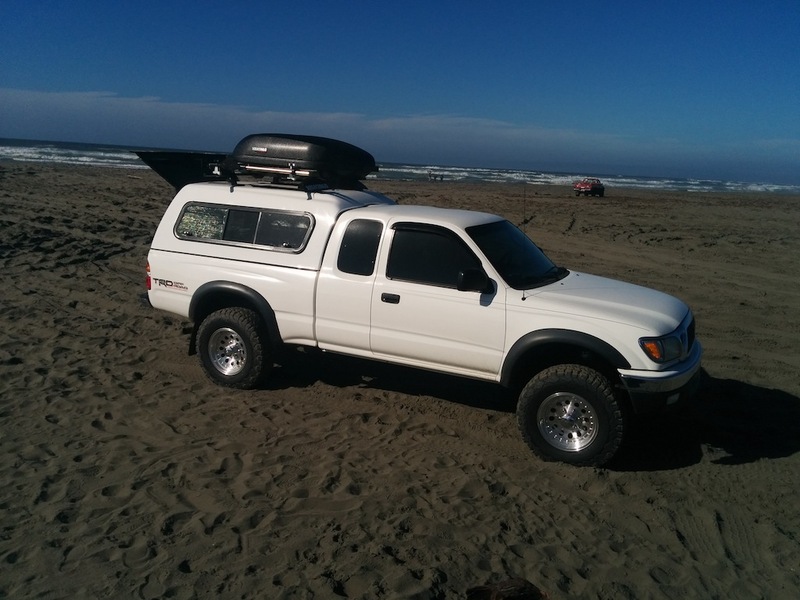 As an emergency “fix” in order to get the Tacoma back up to where we were staying outside of McKinleyville I blasted the joint clean with a can of brake cleaner I had in my tool box, emptied a tube of grease all over it and tie-wrapped a freezer bag baggie around it. Ugly but effective. We just hoped our attempt at a crutch would hold up on the way out of the dunes. No problem, in fact it performed surprisingly well. The noise and vibration were noticeably absent and we made it back with the baggie still in one piece. The next day we ordered a replacement from CVJ Axles in Colorado and a few days later it arrived and we put it on in about two hours. While waiting for the axle to arrive those few days we curtailed any longer trips but still drove the Tacoma around town, baggie still in place. So, timing belt. Important stuff. When was yours last replaced? Spares? If you have the room, a baggie, some tie wraps and a tube of grease are a good start. We now have replaced both front axles so they would both be about the same vintage and the one that wasn’t in tatters when replaced is now in my box o’spares hoping I never have need of it out on the road. In our experience, Preventative Maintenance is spending a little money now to save you lots of money and hassle later.